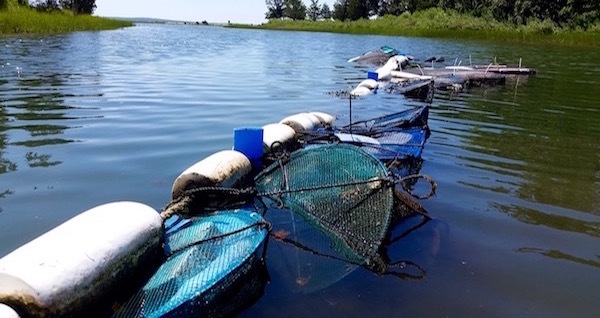 I didn’t really think that I was suffering from Empty Nest Syndrome when I signed up to join the Southold Project in Aquaculture Training in the dead of this past winter. My son left home two years ago now, and I haven’t even bothered to change a damn thing about his bedroom, but it wasn’t for nostalgia’s sake, I thought. It’s just that I’ve been so damn busy. In the dead of winter, I began venturing down to the end of Cedar Creek Road in Southold each month with a marble notebook under my arm, like I did back in my early days of junior college, when I thought I was going to spend my life in a marine biology lab. Kim Tetrault shows off baby oysters setting on a grown-up oyster shell. Oysters do this in the wild. Kim Tetrault, who runs Cornell Cooperative Extension’s SPAT program, considers his lectures to be somewhat of a stand-up comedy routine. He’s just as likely to load you up with amazing facts to share next time you’re the only person at a cocktail party who can shuck an oyster as he is to delve deep into the details of aquaculture studies that he’d helped design over the span of his decades-long career. To some degree, this is a watershed moment (no pun intended) for aquaculture on the East End. Between new plans underway for a SPAT education center at the bay side of Tiana Beach in Hampton Bays to community shellfish gardens out in Sag Harbor and on Three Mile Harbor in East Hampton, the growing of shellfish here is well on its way to becoming an ingrained part of our communities. 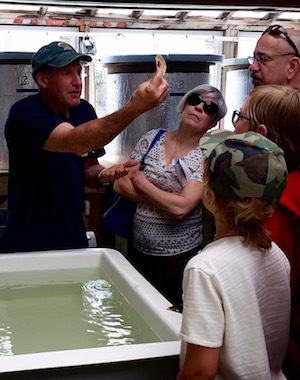 It all started in Southold, where, three mornings a week for the past 15 years, volunteers have helped to clean out aquaculture tanks, refill them with clean water, and feed the millions of oyster larvae that have spent their infancy here. It’s this group of volunteers who make this program something really incredible. 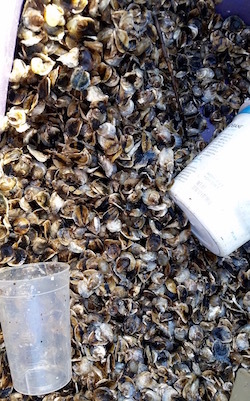 As new SPAT participants came in to pick up their oyster seed in early July, many had no idea how many months that long-time volunteers have spent serving as nursemaids to these tiny little critters. Janice was one of the first SPAT members I met when I wandered in to the Marine Science Center back in the first week of March. She immediately took me under her wing as she made the rounds of the SPAT Shack, where Otto and Armand and a few other select helpers spend their mornings tending to the most important oysters in this place, the ones that are eventually given out to new participants, while she and Brian started to set up a new, somewhat renegade hatchery, just down the dock. As Janice made the morning coffee and the motley crew gathered around a big table in the SPAT office, I realized how devoted everyone around me was to the task of keeping this shellfish hatchery afloat. I began to worry that I’d need to quit my day job and take this on as a full-time job if I ever wanted to be a part of SPAT. Someone’s gotta count all these oysters! But I really had no need to worry. Every time I found a morning to come back, the regular volunteers were happy to put me to work. From sanding and painting boats to counting baby oysters under a microscope, cleaning out trays and tanks to feeding the baby oysters copious amounts of algae, there was always work to be done. And most of them — former doctors, scientists, detectives and mathematicians — seemed totally fine with the idea that I couldn’t be there every day. They’ve retired from some pretty amazing careers, and are happy to still be working hard and sharing their knowledge with the newcomers here. 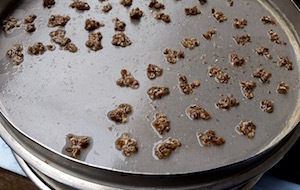 The second week in July, Kim Tetrault sent out an email to all the new SPAT parents letting them know that their 1,000 baby oysters were ready for them. Oysters on the day everyone showed up to pick them up. I showed up with a crowd of people who were new to the program, all brimming with excitement, like fathers at the glass of the nursery, back in the old days when they didn’t let dads in the room when their wives were giving birth. I started out counting out my oysters, one by one, like I’d been counting them in the hatchery for the past few months. But there were people on line behind me, and Kim walked by, en route to one of what seems like a thousand problems he’s asked to solve every day, and peeked over my shoulder to see what I was doing. “I’m naming them,” was all I could say as I rubbed my fingernail over each oyster’s shell, breaking off the tiniest of sea squirts and marveling at their smooth shells. They were each about a third of the size of a dime. By the first week in August, they would grow to be larger than nickels. Your babies grow up quickly if you don’t take the time to sit with them and see the world through their eyes for a while. I learned that the hard way the first time around. SPAT volunteer Bill Dougherty took me under his wing for the day, setting me up with two lantern nets — long skinny nets with five compartments that look kind of like Chinese lanterns, with netting just small enough to keep my new babies from sifting through. 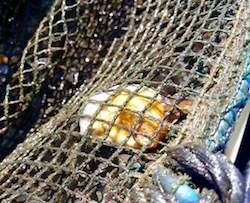 He took me out on the hatchery’s work boat to the long line where the longtimers keep their oysters. This is a big step for oysters — moving from the hatchery to the nursery. It’s kind of like your kid’s first day of Kindergarten. One of my oysters, three weeks after it started Kindergarten. I was so gleeful, I had to stop myself from jumping up and down when we got back to shore. Bill was waiting for word from Suffolk County on whether he’d won a lottery for a lease of bay bottom land so that he could start his own oyster business. It was a hot, hot day, but the optimism emanating from all the oyster parents around was as palpable as the muggy air. As I skipped to the car, SPAT volunteer Victor DiPaola caught my ear in the parking lot. I couldn’t do anything but grin. I don’t know what kind of troubles my oysters will face out there in the big wide creek between this month and the time they grow to full size, but I do know that the volunteers at the SPAT hatchery have given them the best running start they could possibly have had. The day everyone came to get their oysters.